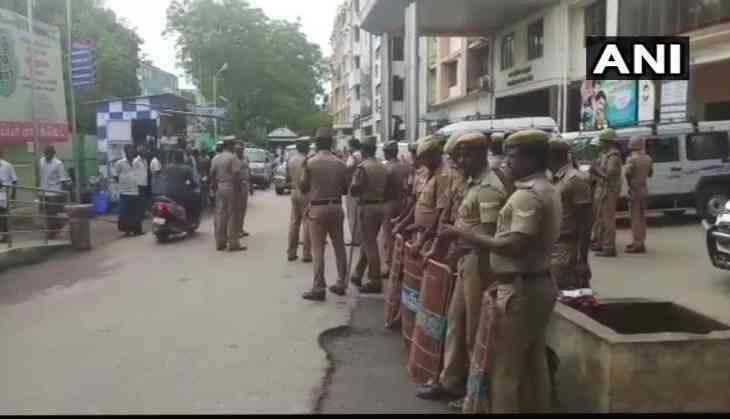 Tension today continued to prevail in the city that witnessed anti-Sterlite protests with two police vehicles being torched and police baton-charging people who forcefully tried to enter a hospital premises to meet those wounded in Tuesday's violence. Two police buses parked in a residential neighbourhood were set on fire by unidentified persons and while the blaze was put out in one vehicle, another was almost completely gutted. A section of people who allegedly tried to forcibly enter the general hospital premises were baton-charged, police said. In view of the prevailing situation, entry to the hospital was highly regulated and when hundreds of people tried to visit the wounded in the facility at the same time, they were dispersed using mild force, they said. Police personnel from neighbouring districts have also been posted here to maintain law and order and police patrols have been intensified. Violence broke out yesterday during protest for the closure of Vedanta group's Sterlite Copper plant over pollution concerns with police opening fire, resulting in the death of 10 people.